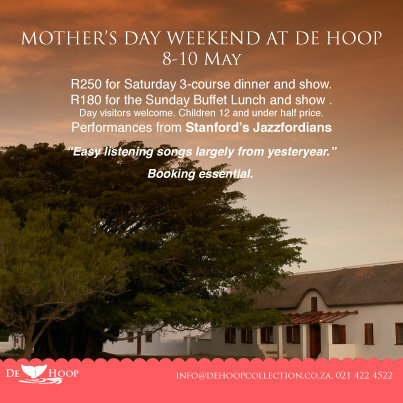 De Hoop Collection is offering a unique Mother’s Day treat this May. Grab the opportunity to spoil your mother by booking for the Mother’s Day weekend, 8 – 10 May, at the magnificent De Hoop Nature Reserve, situated just three hours drive from Cape Town. Treat your mum and the family and enjoy comfortable beds, beautiful views, delicious food and live music from the talented Jazzfordians. Three of the Jazzfordian singing group, Bea Whittaker, Janet Marshall and keyboardist Andrew Herriot, will perform easy listening songs largely from yesteryear, concentrating on those swing numbers which everyone will remember from a bygone era made famous by Frank Sinatra, Shirley Bassey and others; popular sing-a -long songs with a happy beat and a few blues numbers will be thrown into the mix. If booked in for the whole weekend be sure to include a guided Marine Walk at low tide on Saturday. R295 for a family of four - includes a picnic lunch (feeds two adults and two children under 12) at Koppie Alleen. You, your mum and the family can enjoy a delicious 3-course dinner on Saturday and the special Mother’s Day lunch with music, and a special gift for mum. Frequently referred to as the ‘jewel of the Western Cape’, the De Hoop Nature Reserve is undoubtedly the best treat you can give your mom this Mother’s Day. R250 for the Saturday 3-course dinner and show. R180 for the Sunday Buffet Lunch and show (Day visitors welcome). Children 12 and under half price.